Kidliterati: Kidliterati celebrates BREAKING THE ICE and Gail Nall! Kidliterati celebrates BREAKING THE ICE and Gail Nall! Gail Nall's incredible debut, Breaking the Ice, has only been on the shelves for a couple of days, but it's already got people everywhere celebrating. Everyone's showing their love by jumping out onto the ice and busting a few skating moves of their own. And they should be! Breaking the Ice has enough energy and excitement to hold even the pickiest of readers. But we here at Kidliterati want to take a moment to celebrate the author as well. We're not exactly sure how Gail finds enough time to work, write, beta read, mentor, and volunteer for the Midsouth SCBWI. We've thrown around just about every theory imaginable ranging from a TARDIS to a Time-Turner. But the truth is, Gail's just that darn generous. She gives her eyes to her critique partners. She gives advice to writers seeking representation. She gives her writerly knowledge to anyone who asks for it. And maybe best of all, she gives her words to the world. Words like the ones behind that gorgeous cover currently donning the shelves of bookstores everywhere. 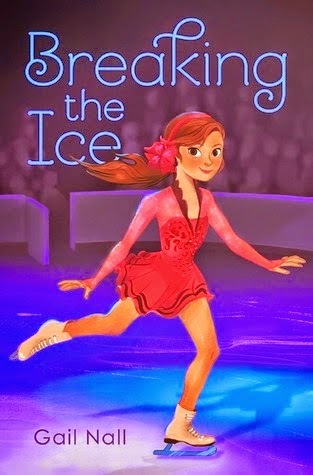 Breaking the Ice is a must-read and takes us along with twelve-year-old Kaitlin as she gets kicked out of her elite skating club only to find that learning a new routine, getting snubbed by her old teammates, and dealing with her crush is a lot harder at her new rink—the "Fall Down" Club. So, Gail, thank you! Thank you for being awesome and writing an equally awesome book! We're so proud of you and we can't wait for your next one to come out! We'll use some of those skating moves we learned to get to the store even faster! Kaitlin has always dreamed of being a champion figure skater, and she’s given up a lot to pursue her passion. But after she has a totally uncharacteristic tantrum at a major competition, she’s dropped by her coach and her prestigious skating club. When no other club will have her, she’s forced to join the ridiculed and run-down Fallton Club, jokingly referred to as the “Fall Down Club.” At first Kaitlin thinks this is a complete disaster, but after meeting some of the other skaters—including a boy who happens to have the most perfect hair she’s ever seen—she realizes it might not actually be so bad. Yet learning a whole new program right before regionals is a huge challenge, and when she realizes that all the other area skaters target Fallton for pranks, she begins to wonder if joining the Fall Down Club has any upsides.